You Can Have Eyelashes That Are Fuller, Longer and Darker with Latisse! Studies show that over time, length, fullness, and pigmentation of eyelashes diminishes. Latisse is the first and only medication approved by the FDA to treat inadequate or skimpy eyelashes (a condition medically called hypotrichosis). It has been available by prescription since January 2009. Approximately 550,000 patients have used Latisse to improve the appearance of their eyelashes. The medication is safe and effective. Have you already had Botox treatment to improve the appearance of facial lines? Or considered dermal fillers for wrinkles and dark circles around the eyes? Then maybe it is time to enhance your eyelashes, too. For every purchase of Latisse that you make at Miami Skin and Vein, you are rewarded with Brilliant Distinctions points. You may use these points toward future Juvederm, Botox, or Voluma treatments, as well! Call Dr. Shaun Patel at 786-618-5039 to schedule a consultation. Together, you will determine if Latisse is right for you. Once Dr. Patel has examined you and provided a prescription, you may purchase Latisse at Miami Skin and Vein. Latisse is a prescription medication and Dr. Patel can only provide prescriptions for patient's of his clinic whom he has seen and evaluated. You receive Brilliant Distinctions points which can be applied toward future purchases at Miami Skin and Vein. Latisse should be applied once daily. Ensure that the face is clean. If you wear contact lenses, remove them. Prepare the disposable Latisse applicator (which is included) by applying one drop of medication near the tip of the applicator but not directly on the tip. Move the applicator along the skin at the base of the upper lash line (where lashes meet skin). Start at the inner corner of the eye, and brush toward the outer part of the lash line. Do not use the medication on lower eyelashes. Use a clean tissue to blot excess solution beyond the eyelid. Dispose of the applicator after one use. Follow steps 1 through 6 for the other eye. 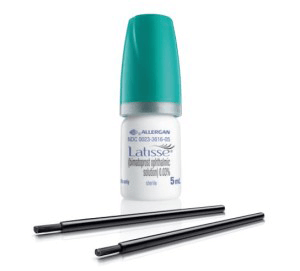 Can I use Latisse while wearing contact lenses? You must remove contact lenses prior to applying the medication. They may be reinserted 15 minutes after Latisse application. Yes! In clinical studies, 78 percent of users showed significant eyelash enhancement after using Latisse for 16 weeks. After 16 weeks, eye lashes were 18 percent darker, 25 percent longer, and 106 percent fuller on average. The medication is believed to work by prolonging the natural active growth phase of eyelash hair. Individuals with an allergy to Latisse or any ingredients in the product should not use it. If you have glaucoma or increased intraocular pressure, be sure to notify Dr. Patel or you eye doctor before using this medication. What will happen to my eyelashes if I stop using it? Your eyelashes will return to their normal appearance after a few weeks to months of not using the medication. This medication is available only with a prescription, and may be purchased at a doctor’s office or a retail pharmacy. You may purchase Latisse at Miami Skin and Vein if you are a patient of Dr. Patel and he has seen and evaluated you. Patients will see longer, fuller, and darker eyelashes after 16 weeks, on average. Does Latisse cause darkening of eyelid skin or the iris? Darkening of the iris and eyelids have been reported with use of Latisse, caused by increased melanin in the skin or iris. Eyelid pigmentation usually reverses after you stop using the product. Iris darkening can be permanent. Request a consultation online or call 786-618-5039 to schedule your appointment. Miami Skin and Vein serves patients in and around Coral Gables, Fort Lauderdale and other nearby areas of Florida.